Before the beginning of the service, the Precious Cross is brought from the table of the Prothesis or the sacristy and placed on the Holy Table. A candle is lit and left burning in front of it. shine with the light of your grace upon the hearts of those that honour you. With love inspired by God, we embrace you, O desire of all the world. and have passed over to unending joy. for we entreat with faith your rich protection and great mercy. as the congregations of the faithful keep the feast. you are the victory of kings and the glory of priests. rampart set about the Church. bestowing on the world great mercy. when of old with bitter pleasure you tasted of the three in Paradise. See, the Tree of the Cross, revered by all, draws near! and we have received great mercy. is now entrusted to the archangel Gabriel. Rejoice, pure dove! Rejoice, all holy one! Make ready by your word to conceive the Word of God! The womb of the undefiled child of God. held in bitter slavery to the jealous enemy. Many ages have passed since its beauty was destroyed. Make haste to descend to earth, O Lord! Come to deliver us from the way of death! Rejoice, chosen vessel made perfect for God! Rejoice, life-bearing dawn of the endless day! The Lord, Whom the heavens cannot contain, is pleased to dwell in you! that all mankind might be restored to life. for You alone are longsuffering. Rise up and fight against our enemies in Your almighty power. and by the weapon of the Cross cast down our enemies. and that we who put our trust in You shall conquer. grant us Your great mercy. You shall remain inviolate and yet shall bear the Lord! 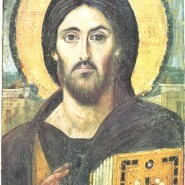 Save Your people, O Lord, and bless Your inheritance. * Grant victory to Your faithful people against enemies,* and protect Your community by Your Cross. Today is the herald of joy for the universe! * Let us anticipate the feast and celebrate with exultation:* Gabriel is on his way to announce the glad tidings to the Virgin;* he is ready to cry out in fear and wonder:** Rejoice, Lady full of grace, the Lord is with you! Deacon: Wisdom! Let us be attentive! Save Your people, O Lord, and bless Your inheritance, * grant victory to Your faithful people against enemies, * and protect Your community by Your Cross. Afterwards, the following is sung three times in the usual manner. and we glorify Your holy Resurrection. 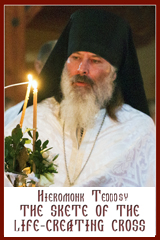 The Divine Liturgy of St. Basil the Great is celebrated today. Troparion, Tone 4: Today is the herald of joy for the universe! * Let us anticipate the feast and celebrate with exultation:* Gabriel is on his way to announce the glad tidings to the Virgin;* he is ready to cry out in fear and wonder:* Rejoice, Lady full of grace, the Lord is with you! To Your Cross, O Master,* we bow in veneration,* and we glorify Your holy Resurrection! Save Your people, O Lord, and bless Your inheritance. In you, O Full of Grace, all creation rejoices: the angelic ranks and all the human race. Sanctified temple and spiritual paradise, virgins’ pride and boast, from whom God is made flesh and became a little Child; and He who is our God before all ages, He made your womb a throne, and He made it wider that all the heavens. In you, O Full of Grace, all creation rejoices. Glory be to you. Неділя Хрестопоклонна. Передсвяття Благовіщення.Прп. Захарії. Св. Артемона, єп. Селевкії Пісідійської – 24 березня. Згідно Типікону в цей день служиться літургія св. Василія Великого. Тропар (глас 1): Спаси, Господи, людей Твоїх* і благослови спадкоємство Твоє! * Дай перемогу благовірному народові над супротивниками* і хрестом Твоїм охорони люд Твій. Тропар (глас 4): Днесь всесвітньої радости передпразденственне оспівати веліють. Ось бо Гавриїл прходить, несучи Діві благовість, і до неї кличе: Радуйся, Благодана, Господь з тобою. Кондак (глас 8): Вже полум’яне оружжя не охороняє врат єдемських,* на нього бо прийшло преславне погашення – Древо хресне;* смерти жало і адову перемогу прогнано,* і став ти, Спасе мій, перед тими, що в аді,* кличучи: Увійдіть знову в рай. Кондак (глас 8): Для всіх земних ти єси начало спасення нашого, Богородице Діво,* Божий бо служитель з неба посланий явитись перед тобою*-великий чиноначальник Гавриїл, радість обрадованну тобі приніс. * Тому-то всі кличемо тобі:* Радуйся, Невісто неневісная. Прокімен (глас 6): Спаси, Господи, людей Твоїх* і благослови спадкоємство Твоє (Пс 27,9). Стих: До Тебе, Господи, взиватиму; Боже мій, не відвертайсь мовчки від мене (Пс 27,1). Алилуя (глас 1): Алилуя, aлилуя, aлилуя! Стих: Пом’яни соньм твій, що його придбав ти іздавна (Пс 73,2). Стих: Бог же – цар наш перше віку. вчинив спасення посеред землі (Пс 73,12). Замість Достойно: Тобою радується, Благодатная, всяка твар, ангельський собор і чоловічеський рід, освященний храме і раю словесний, дівственна похвало, що із неї Бог воплотився і младенцем став – перед віками сущий Бог наш. Лоно бо твоє престолом сотворив і утробу твою просторішою небес учинив. Тобою радується, Благодатная, всяка твар, слава тобі. Причасний: Знаменувалося на нас світло* лиця Твого, Господи (Пс 4,7). Алилуя (х3).